Over the weekend in Louisiana, some food stamp recipients realized that their EBT cards were suddenly showing up as having no limit, resulting in empty shelves and overflowing shopping carts as people tried to buy as much stuff as possible with their cards before the glitch was fixed. Now, Walmart and Xerox are playing the blame game over who’s at fault. It all began on Saturday, when Walmart managers in two Louisiana towns called the police because customers were filling the stores and emptying the inventory because their EBT cards were not showing any credit limits. 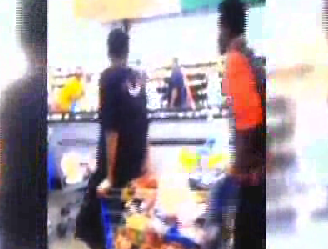 “Some people had eight or 10 shopping carts full of groceries,” said the Police Chief of Springhill, LA. By the time he arrived at his local store at 7 p.m. on Saturday, he says there were hundreds of customers with overflowing carts waiting to check out. The Chief says he told the manager he had the right to refuse service, but the manager claimed he’d been instructed by Walmart HQ to accept the limitless cards. A few hours after he arrived on the scene, the glitch was fixed and limits were reinstated. “When they heard the announcement, people just left their carts in place and walked out of the store,” recalls the Chief, who says that police were not needed to disperse the crowd of shoppers. The big question is: Who’s going to pay for this? EBT money is paid by the state and uses money provided by federal subsidies. The state of Louisiana is most certainly not going to pay for all the stuff that should have been disallowed had the system been working properly on Saturday. “The outage was the result of failures by our contractor, Xerox,” said a spokesman for the Louisiana Department of Children and Family Services. When the system went down, retailers have a phone system for getting authorizations on EBT purchases. While Xerox admits that its EBT-processing system suffered an outage on Saturday, it points out that Xerox has a “documented process for retailers like Wal-Mart to follow in response to EBT outages,” thus putting the blame for the crazy scene back on the nation’s largest retailer. And when it comes to questions about paying for all those extra purchases, it refers questions to Walmart. Meanwhile, Walmart is referring all questions to Xerox. Maybe they’re both hoping that, like a child who ping-pongs between parents who keep deferring to each other, the state will just go to its room and read a comic book. It looks like it will ultimately be Walmart on the hook for the purchases, as the state says purchases made above a card’s available balance will be returned to Walmart marked “as insufficient funds.” So the retailer will need to try to squeeze the money for those purchases out of Xerox.